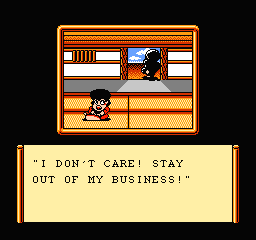 In Ganbare Goemon Gaiden, Kid Ying and Dr. Yang set out on… Hahaha, just kidding! 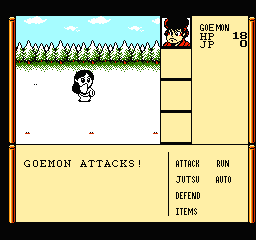 This game is a role playing game for the Nintendo Entertainment System, with turn-based battles that resemble those of the Dragon Quest series. 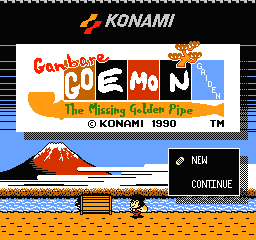 Throughout the story, Goemon (along with the friends he makes on the way) travels across Japan, and other surprise locations, in search of whoever is responsible for stealing his precious golden pipe. 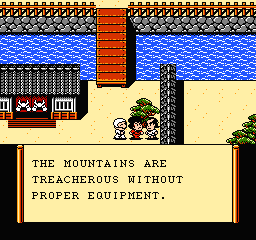 In typical RPG style, the towns are each experiencing their own problems, and helping them out just happens to coincide with finding a new lead for trailing the main enemy. 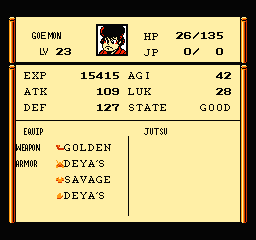 Interestingly, Ganbare Goemon Gaiden saw the introduction of many series staples and beloved characters, despite being a spin-off. It’s a pretty easy game overall, but the dungeons can be very confusing and maze-like. The music is great, and the enemies are well animated in battles. It does have a few flaws (such as not being able to tell who can equip something before you buy it, or how it compares to what you currently have), but is still well worth playing and should probably be regarded as one of the best 8-bit RPGs. Version 0.99: Everything translated apart from the credits (which are bugged in the original game).